It’s the opening day of salmon fishing here….so I figured I should probably share this fishing quilt I made for my son’s birthday 3 MONTHS ago. Holy cow 3 months went by fast! I decided to make my son a fishing quilt for his bed since he is fishing obsessed. On a whim I bought a whole bunch of fishing related fabric, and then endured sewing torture making a twin size quilt with fishing fabric. It is so hard for me to sew with fabric I don’t really like! 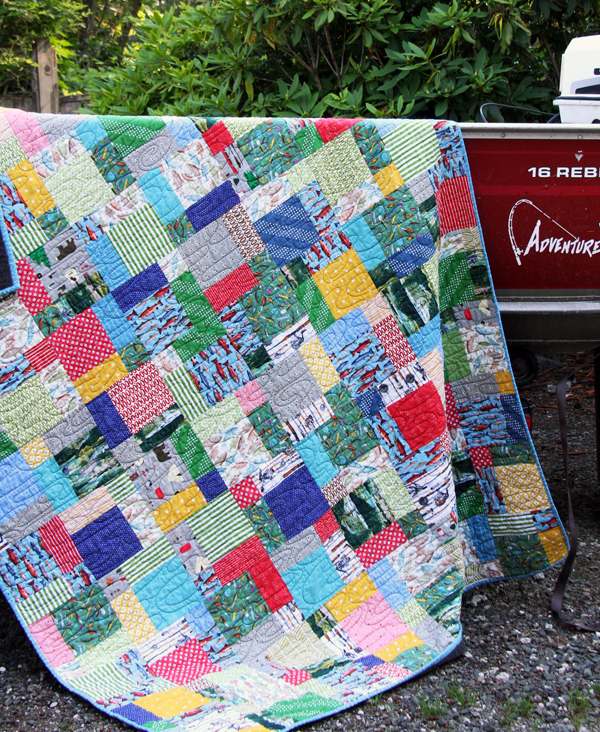 What better place to take a photo of a fishing quilt than on our (((piece of junk that takes up room in the yard))) fishing boat?! Oiy. I found most of the fishing themed fabric on fabric.com, then I mixed in basics and some fun prints to match. The pattern is Easy Bake, modified slightly to make smaller blocks. Kathy quilted this with a wavy-water looking pattern, with thread that matches the awesome backing. 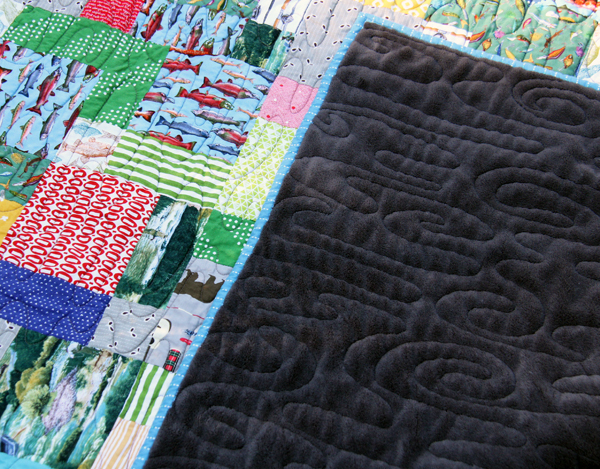 This quilt has great weight and texture, and is a little poofy thanks to the blanket backing. I bought a few of the Threshold fuzzy blankets at Target during their Black Friday sale last year. They are so extremely soft and don’t shed like some of their other blankets. This one is pretty thick, but not much thicker than regular minky fabric, and it’s probably even a bit lighter. Since this is for my son’s bed and he doesn’t use any other blankets I also used batting in this quilt. If you are quilting the quilt yourself…they are hard to use and hard to baste with, whether using spray or pins. They don’t slide as easily through your machine when doing free motion or straight line quilting, and they are so thick they are tricky to get under the presser foot. Ask your long arm quilter if they are OK with you sending a blanket like this as a backing. I emailed Kathy ahead of time to clear it with her first. I know some quilters won’t use minky, or sheets and blankets. Buy a size larger than your quilt. I made a Twin size quilt, and I bought a Queen size blanket so I would have enough extra around the sides for the long arm quilter to use. Prewash and preshrink your backing blanket/sheet! Backings from yardage can easily be $50 + if you buy the yardage is states on the pattern, so quality cotton sheets or blankets like these can be a great alternative. I LOVE the new cotton 108″ wide backings offered now…and that might even be a cheaper option if you are just looking to lower your cost of the backing. I’ve bought the 108″ backings from Fat Quarter Shop and Hawthorne Threads in the past. I think that’s it but if you’ve used blankets or sheets as backings and have any other tips, or a good source to buy quality sheets from, please put it in the comments below! Nice finish. I’ve used the Threshold 100% cotton sheets for backings. Work great and super affordable, especially when you can catch them on sale. I’ve used blankets as the batting. I also used minky as a backing in another child quilt and didn’t find it problematic. Who knew there were so many fishing fabrics???? That is great! Oh, this brought back memories of the Froggy Quilt of Many Colors that I made for my son about 10 years ago! I definitely related to the bit about forcing yourself to work with fabrics you don’t love (frog fabrics are equally thrilling as fish fabrics, I assure you!). That’s a great tip about the Threshold blanket from Target. How much did that cost? I have heard not to use sheets as backing due to the higher thread count, but hadn’t considered using a fleecy blanket. The professional quilter I’ve used doesn’t mind sheets as backing if they’re not high-thread-count. So “cheap” sheets are the way to go! Love the fleecy blanket though! I machine quilt on a frame. The problem with the higher thread count for me is this: If you have to pick out any stitches, or you don’t immediately notice when the bobbin runs out, the extra holes are almost permanent. That said, I use sheets for my quilts often. I’d be less happy if the quilt was for a customer. I want them to be 100% thrilled. I don’t want any “Oh, look at this!” comments when they get home because they never look really closely when they’re picking the quilt up from me. I’ve heard some people say that the higher thread count interferes with the tension, even causing thread breaks but I have had no problem with that at all. Connecting Threads is a good place to get 108″ fabric at a very reasonable price. Thank you for the tip!! Love how you mixed and matched all the prints and solids in this beautiful quilt. What a happy smile on your son’s face – doesn’t it make your heart melt and all the work on the quilt definitely worthwhile :)! Easy Bake is my “go to” quilt pattern! If you place two side by side, because of using different fabrics, they don’t even begin to look like the same pattern. 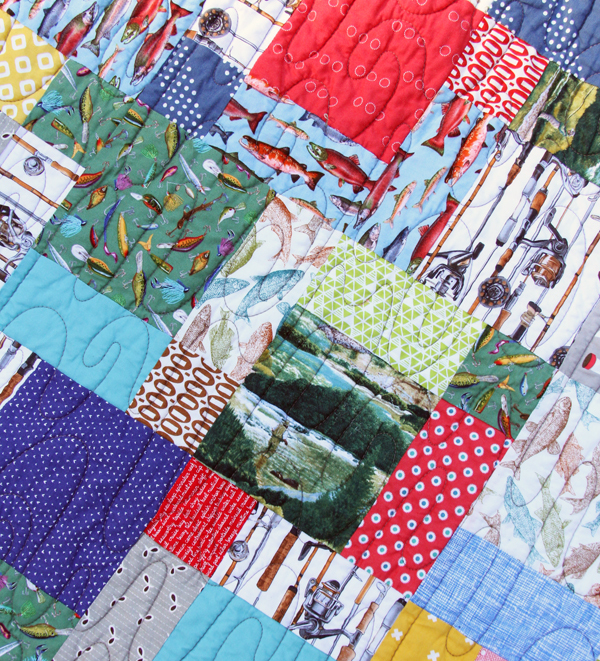 With the other fabrics in this quilt…it’s not too fishy. From the smile on his face, I would guess the torture was worth it. It turned out fantastic and I bet he just LOVES it!!! Awesome finish. Thanks for sharing the part about struggling when you didn’t like the fabrics. With the grin on your son’s face, I’d say it was worth powering through! I have used several all-cotton sheets as backings and had no problems. I also love 108″ wide fabric. A wonderful source I just discovered for wide backing fabric is backsidefabrics.com. Their everyday prices are reasonable and their sale fabric is unbeatable. Did you know that 1 yd wide backing =2.5 yds 42″ wide fabric? That little fact was included in my last order from Back Side Fabrics. 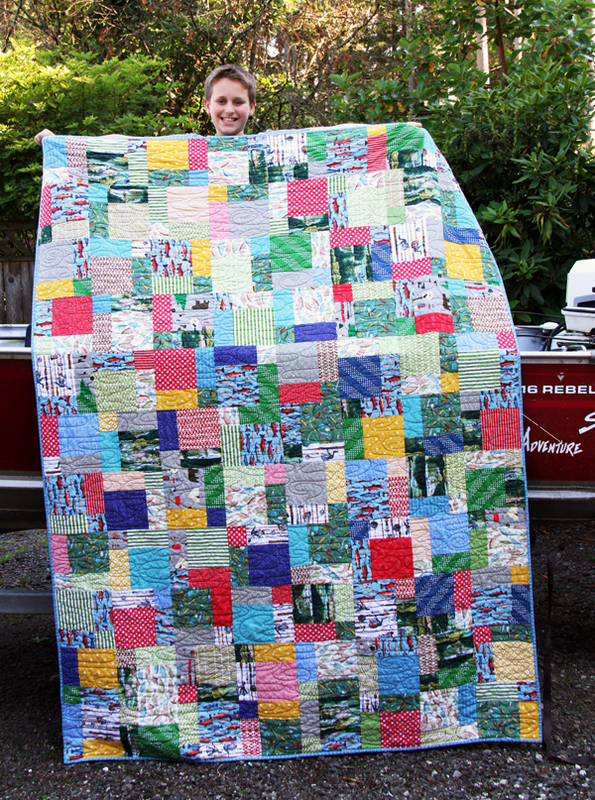 It looks like your young fisherman is very pleased with his new quilt! I know what you mean about having difficulty making a quilt out of fabric you don’t like – I’ve made a couple of quilts where I made the mistake of letting somebody else have too much influence over the design or fabric choice and as a result I felt it wasn’t my quilt or didn’t like what I was making. But I hope Ben’s big smile made it worth your while! It’s clear he likes it! As a quilter you can’t indeed complain about some other family member’s hobby! We, quilters tend to take over the whole house!! The quilt is great for your son, I guess he is thrilled. Never mind the fish fabric. I don’t like to sew fabrics I don’t especially like, but …if it is for a good cause!!! I love this quilt and hope it keeps your son in sweet, fishy dreams. I love the 100+” backing from Connecting Threads. There aren’t a boat load of choices, but there is enough variety to pick from. This online shop has great backing fabrics. I’ve bought from them before and never been disappointed. Sooo funny and what a nice mom you are! 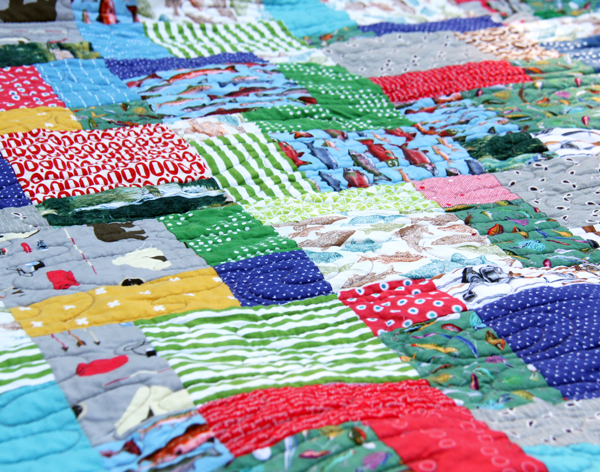 Your quilt came out great and he’ll treasure it – even if there are lots of fishes on it. I love your pattern and have made a few quilts with it too! You have great instructions/pics with your patterns! Yes, we must watch what we say because our love of quilting comes back to haunt us! Great job on the fish quilt! He looks happy with it. My two grandsons would love it too! I love this quilt. You did a great job. I have used sheets for years. I always preferred plain muslin as a backing but once I saw a colorful sheet at a thrift store, I started using them. They do great on a long arm and wash up wonderfully. He looks so happy! Terrific quilt. Oh – he loves it! My boys are in their 30’s and they would love it, too. You’re the best mom ever! I think the quilt is great! I know your son will treasure it forever. I like the variety of fabrics you used. I live in VA Beach and we have such great ‘beach/ocean’ prints, but have not made a baby quilt – now I will try it for the local babies! Whenever I make quilts for children I look for themed material either to match their bedrooms, their favorite cartoon character, or sports team. One year I made a bunch of Ninja Turtle quilts for Christmas for all the children I was gifting that year. For my quilt backing I always use flat bed sheets, they are so easy to use and there are so many color choices available it makes it easy. Most of the time when you can get the sheets on sale at Walmart it actually turns out cheaper than buying fabric of the bolt. What a great quilt and it looks so big!!! Nice Job!!! I always love the colors you use in your quilts! Looking at that huge smile on his face, he obviously loves it!! :) I’ve never used anything like that for the backing- will have to keep that in mind! I’ve only used sheets which does help with the cost! Have a great holiday tomorrow with your family! Thanks for the post and everyone’s comments. I had not known one could use sheets as backing. Ta-da!! I made a larger than queen size quilt for my son. I used Bonnie Hunters Scrapoy Trips pattern. I figured that I had used 13 yards of fabric in the top alone. I used a fleece king sized blanket from Macy for the backing. I used Thermore batting which is paper thin. The Thermore really helped the top and fleece from sliding around as I wrestled this monster through my domestic machine. Not to brag, but I didn’t have a pucker! Miracles do happen! I bow to you Susan!!! That takes serious skill and arm/shoulder muscles to wrangle a queen size quilt with a fuzzy backing through a machine!! Maybe I’ll attempt it on my next one…although I’m guessing I’ll have a few puckers! ;) Bravo!!! Also you are definitely allowed to brag about that…it’s a major accomplishment!! Your fishing quilt is great – and your son will think of you when he uses it. Years ago I made my son a bedspread for his queen-sized bed, using outdoor and fishing-themed fabrics. I had to make it in sections (was quilting it myself), quilted each section, then sewed them together. Turned out well, but haven’t made one that size since!!! You and me both! Great idea though to piece them together afterwards! Love the fishing theme! My sister made a throw for my husband using fishing fabrics. It is very special because it is the only hand quilted piece she made before she passed away. Will always be dear to us. Oh that is awesome…what a treasure that will always be for you!